1902: The Pasadena and Mt. Lowe Railway Company is deeded to Pacific Electric Railway. Officially incorporated as the “Pasadena & Mount Wilson Railroad Company,” the Mt. Lowe Railway opened on July 4, 1893. It ran from Rubio Canyon to the summit of Echo Mountain. After a trip across Pasadena and Altadena, passengers arrived at Rubio where they transferred to an incline railway rising 1,300 feet at a maximum 62% grade — the steepest railway in the world at the time. During its short life, Mt. Lowe became one of Southern California’s primary tourist attractions, with more visitors than either Yosemite National Park or Catalina Island. 160,930 passengers were carried up the mountain in 1921, the railway’s busiest year. Thaddeus S.C. Lowe ran the rail line for seven years. It briefly passed through two other owners before being sold to Henry Huntington, who operated it as a very popular side venture to compliment his extensive Red Car system for the next 35 years. The top of Echo Mountain featured a 70-room Victorian hotel, the Echo Mountain House, as well as the 40-room Echo Chalet, along with an astronomical observatory, car barns, dormitories and repair facilities, a casino and dance hall, and an animal menagerie. Sunrise services were elaborate productions at the Mt. Lowe Resort atop the summit. One Pacific Electric brochure from 1926 promoted special railcars departing downtown Los Angeles as early as 2:30a.m. in order to reach the summit before dawn. While the Mt. Lowe Line would become one of Pacific Electric’s most popular tourist lines into the 1930s, it was beset by challenges. Fires damaged parts of the railway in 1900 and 1905. The final blow came on September 15, 1936, when the Alpine Tavern burned to the ground, destroying one of California’s most famous landmarks. On December 5, 1937, the incline railway made its last run. The railway itself was largely destroyed by a cloudburst in March, 1938; the swirling torrent raged through the ruins of the tavern and swept down the canyon to carry away two of the major bridges and wash out the roadbed. 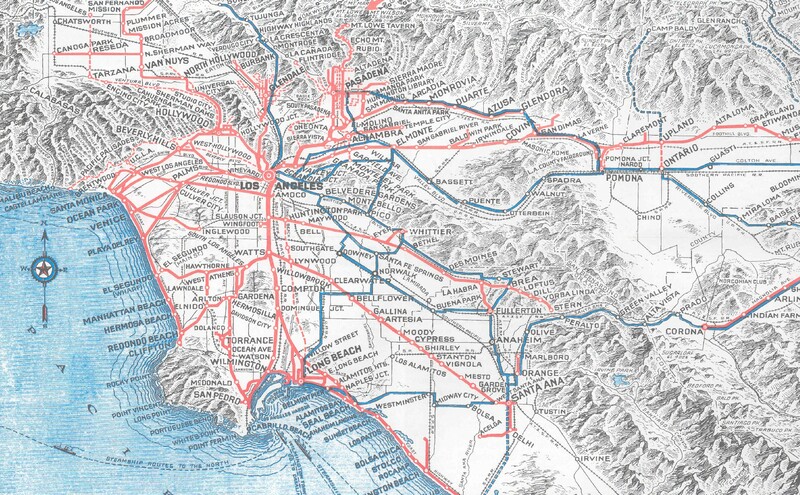 A month later, Pacific Electric formally abandoned the Mt. Lowe Line. Several additional photos of the Mount Lowe Railway in our Archive, many of them only discovered in 2012, can be found in our online Flickr photo gallery.